It has been a crazy week around the world, and the facade’s paint has worn thin enough for it to become more undeniable that what was painted over is a bit rotten. 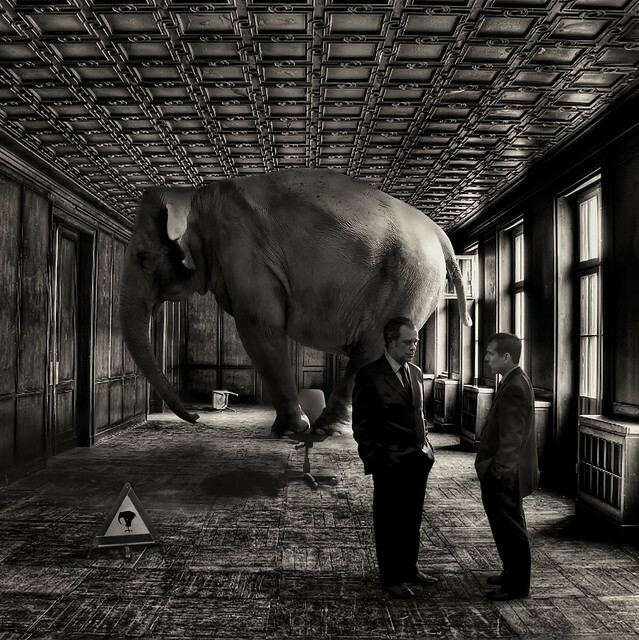 The trouble isn’t necessarily the elephants in the rooms, the trouble is the rooms can no longer hold the elephants. It’s easy to talk about the slaying of innocents when the rhetoric dehumanizes broad swaths of people by a flawed design while people argue over the intent. Whether the intent was there or not when these systems were designed, the elephants threaten to get out of their rooms and that can mean the end of structures as we know them. As it should be, maybe, but the bureaucracy has it’s carpenters, welders and construction workers with Law texts and legal precedents given voice with those armed with cattle prods. I imagine using a cattle prod on an elephant isn’t too smart, but then I have a bias toward self-preservation. Society’s self-image and it’s increasingly apparent conflicts between groups within it makes me wonder whether people realize what they’re pretending to be. Cognitive dissonance is a currency traded upon by politicians, be they professional or otherwise, and the tools of society are mocked. We design solutions that create new problems; we create movements that by their very names are divisive. Equality. Is that such a hard concept? Why is it that every ‘solution’ actually attempts to elevate some group above others to make things more fair when there are many groups who are treated unfairly? It’s an engine that opposes itself, burning itself out and boiling over into more wear and less actual progress than could happen if people worked all together. Maybe when the elephants get out, they might see each other for elephants. Maybe the walls that separate them blind them to the fact that they are not alone, which some might argue is by design? And when the structures do come down, as they will over time, what will be left? Society remains conflicted. Should we fix this and make a bigger door? Whatever should we do? Yet the focus seems to be now shifting between whether the elephants should be in rooms at all, or whether the elephants should be kept separate. Oddly, the elephants themselves seem intent on keeping themselves separate while well-wishers seem intent on freeing them. There’s more than one elephant, and would they actually work together… but instead, they maintain the divisions built around them. At that rate, they will ever struggle and never parade except when let out for their exercise. Whenever that happens.